Heritage Ceramics are English stone flooring specialists supplying premium quality floor and wall tiles sourced from all over the world. With over 15 years’ experience in the contemporary marble stone flooring and aged stone flooring industry, Heritage Ceramic tiles offer high quality products for your living spaces. Heritage Ceramics work closely with their reputable suppliers to provide customers with stone flooring tiles and flagstones made from premium materials at up to 50% better prices than you'll find on the high street! 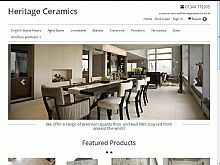 Find out more about the large range of stone and ceramic tiles available from Heritage Ceramics.